It’s that crazy time of year again. As we dash about the farm, we alternately slip on a patch of ice here and get stuck knee deep in mud there. We have so many projects to do, we could use forty hands instead of four. 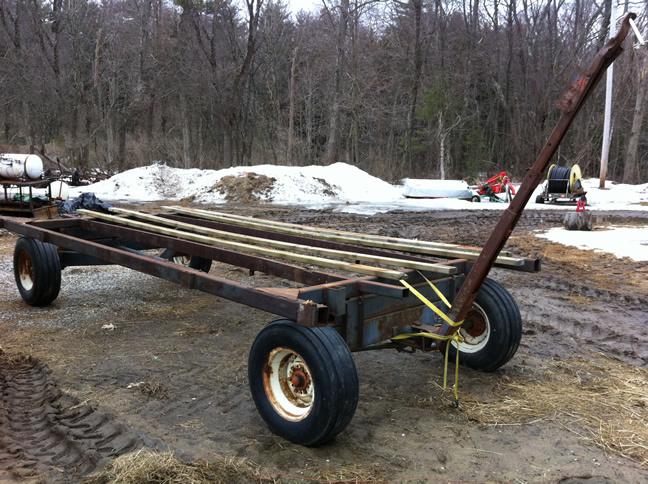 Here is one example: we bought this old hay wagon from a neighbor. Three weeks from now, it would be really great if there were a finished chicken house sitting on top of it, ready to roll our laying hens out onto the pasture. We will do our best, and I’ll let you know how it turns out. I am interested in buying some whole chickens and learning more about your farm. Your web site is informative and I would like to stop in and visit the farm. Are you open to the public. Visitors to the farm are always welcome, however, it is best to call ahead to schedule a time.